CHARLOTTE, N.C. — This year’s annual meeting was supposed to be a victory lap for Bank of America, with many of its mortgage problems receding and its deposits and credit card business growing. Instead, executives and board members faced pointed questions from shareholders on Wednesday about a costly error in the way the bank calculated its financial health. The $4 billion error forced Bank of America to suspend its planned dividend increase and raised broad issues about oversight inside the bank. Speaking for the first time about the problem since it was disclosed last week, Charles O. Holliday Jr., the bank’s chairman, gave a full-throated defense of the way executives have responded to the $4 billion capital miscalculation. Bank of America, the nation’s largest retail bank, disclosed the problem to regulators shortly after an employee, who is not a senior executive, discovered it while preparing a routine quarterly financial report. “I believe very strongly that this bank is not too big to manage,’’ said Mr. Holliday, who has been the bank’s chairman since 2010. Despite hundreds of new regulations intended to reduce the threats that large financial institutions pose to the global economy, the biggest banks are facing new questions about their size and complexity. The error stemmed from how Bank of America accounted for certain losses on bonds that it acquired when it bought Merrill Lynch in the depth of the financial crisis. The miscalculation had gone undetected for several years. As a result of the error, Bank of America has $4 billion less capital than it had represented to the Federal Reserve on this year’s stress test. The bank’s shares are down nearly 5 percent so far this year. On Wednesday, its chief executive, Brian T. Moynihan, expressed disappointment in what he called the bank’s “capital adjustment” but suggested that it was a momentary breakdown in the otherwise efficient operation of a sprawling bank. Bank officials said they were conducting a “third-party review” of how the problem happened, but declined to name the firm conducting the review. “This was an error that we found and fixed,’’ said Mr. Moynihan, whose $14 million pay package was backed by shareholders on Wednesday. Shareholders also re-elected all five members of the board’s audit committee and supported the rehiring of the independent auditor PricewaterhouseCoopers, though the vote was nonbinding. The issue is also testing the patience of smaller investors like Thomas Ashe Lockhart, who has owned the bank’s shares for about 40 years. “Anybody involved in this shouldn’t get a raise,’’ Mr. Lockhart said in an interview after the meeting. The miscalculation related to the complex Merrill debt instruments – called structured notes — comes as Mr. Moynihan seeks to showcase progress on one of his top goals: simplifying the bank. Mr. Moynihan described the many ways he had pared down the bank including selling off private equity investments and winding down its troubled mortgages from 1.4 million that were at least 60 days delinquent at the peak, to about 277,000 today. He said the bank was extending new mortgages and credit cards, but only directly instead of going through third parties, which is helping improve credit quality and efficiency. But the bank still faces billions of dollars of legal costs to settle cases with federal prosecutors over its sale of mortgages that quickly defaulted. Executives have declined to detail how much they are reserving for those cases because it could hurt their negotiating position. 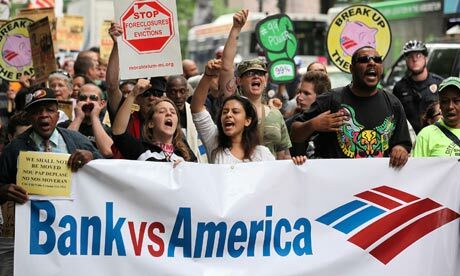 In the years since the financial crisis, Bank of America — and its shareholder meeting – has been a lightning rod for critics. As it serviced the hundreds of thousands of defective mortgages that it inherited through its acquisition of Countrywide Financial, Bank of America became in many ways the face of the banking system’s bumbling actions during the foreclosure crisis. But at this year’s meeting, the focus of the questions was not primarily on mortgages. A few homeowners and advocates even came to the meeting to praise the bank for finding ways to lend to lower-income people. Still, Mr. Moynihan faced criticism from environmental groups about the bank’s lending to coal companies and even questions from the 13-year-old daughter of a former bank employee, who she said had been laid off and whose job was sent overseas. Mr. Moynihan acknowledged that the cost cutting across the company had been a difficult process, but said the bank did not ship jobs to other countries. “We don’t do that,’’ he said.